Have you ever hesitated to buy expensive theater tickets, only to find that the same seats cost much more or less a week later? Welcome to supply-and-demand pricing. Thanks to today’s sophisticated measuring techniques, adjusting the cost of a ticket is no longer a guessing game but rather a question of examining the data: current vs. past sales patterns, velocity of sales by section, subscription vs. single ticket sales, and so on. Charging more (or less) for the same seat during the on-sale window. made the team slightly optimistic that they could have a hit on their hands. They put a plan in place for a modest price raise if they got good reviews on opening night, which they did. From there they kept raising prices as the demand for tickets got stronger, which provided the opportunity to extend the show for an extra week. The starting prices for the extension week were the ending prices for the initial run, and CTG continued to raise prices during the final week. For the week after opening the average revenue per performance was around $25,000. For the extension week that number rose by around $10,000, with the weekend performances grossing close to $40,000. (See Charts 1 and 2). This pricing strategy brought CTG $68,000 in additional revenue. Also, the average yield (the amount brought in per ticket sold) rose by $2.50. Note that this number is a more important metric than average price, which is the initial price of the ticket. Note that the average ticket was discounted almost 24% de to reduced-price offerings to subscribers and during previews. Lessons learned from CTG’s success: plan ahead, make continued price changes on all performances, and maximize revenue when demand is highest (extension week). The Tennessee Performing Arts Center (TPAC) in Nashville has a cross-functional pricing team that meets weekly to review data and adjust prices. The team has representatives from marketing, ticketing, and programming. 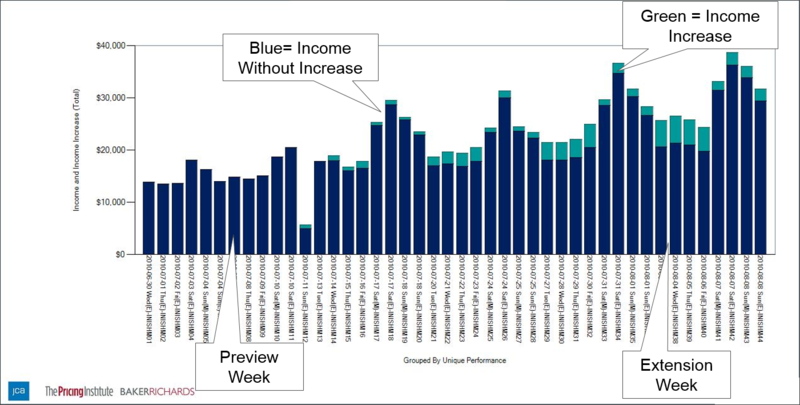 For a one-week run of a touring Broadway show they start with how the show is performing financially. 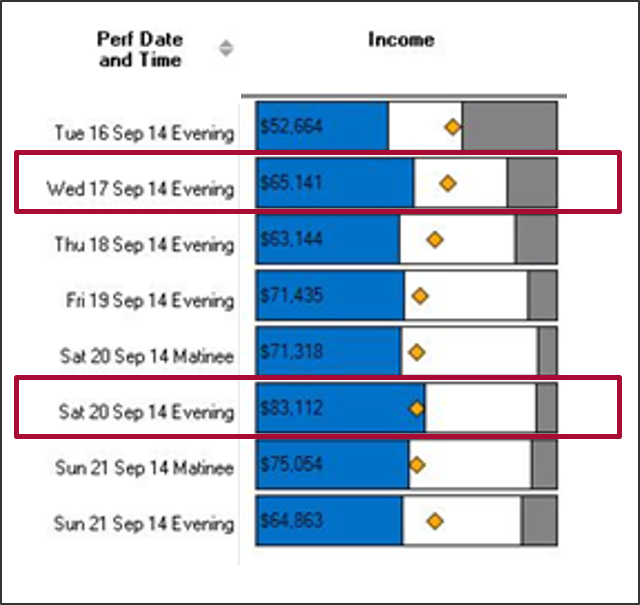 Chart 3 shows that two of the performances Wednesday evening and Saturday night (highlighted in red) have brought in more income to date. They know which performances are selling well, but they don’t know which seats are selling well. They need more evidence before making a price change such as: which seats should they consider for price raises. Chart 4 helps them make that decision. This report shows ticket sales by price. The top two prices are selling best, which is what TPAC hopes will happen. 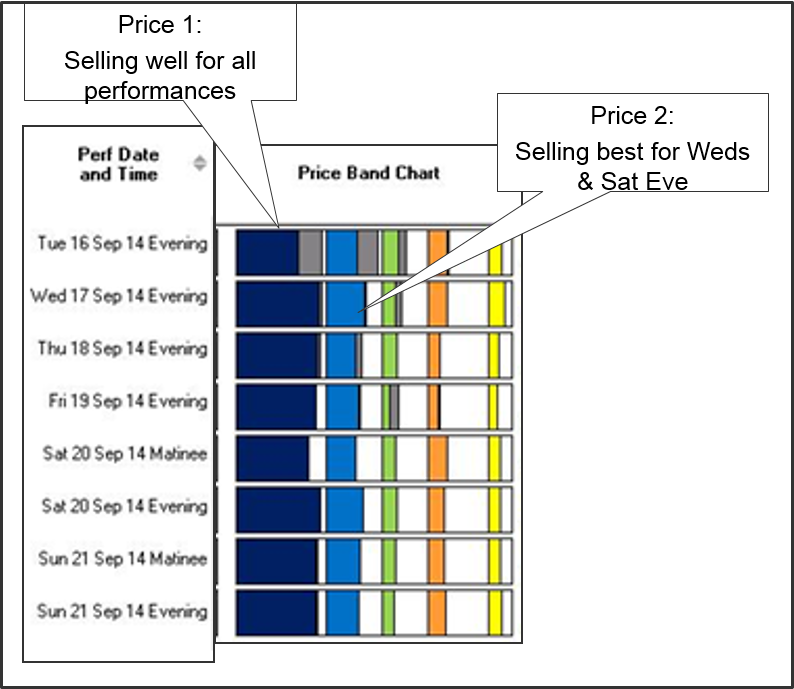 Price 1 is selling well for most all performances, and Price 2 is selling best for the four performances identified in Chart 3. The team decides to raise Price 1 for all performances and Price 2 for Wednesday and Saturday evenings. TPAC made multiple price changes based on demand. Chart 5 shows the price history from initial public on-sale to the performance date in four sections of the house. Sun. Mat Front Balcony: Section was put on sale @$60 with little initial interest. Once demand for the show grew TPAC was able to raise prices by $20 and sell out 96% o the section. Lessons learned from TPAC’s success: First, the members of the team each brings a different perspective to the collaboration, which helps make the most impactful decisions. Second, the team takes a graduated approach; starting with income per performance, moving to price levels, and then determining how to keep their price/value messaging in place as they make the pricing changes. The Cincinnati Symphony Orchestra performs in the 3,400-seat Music Hall. Completed in 1878, it is the third-largest permanent concert hall in the U.S. Trying to fill that number of seats per night can be a challenge, so even though the orchestra can sell thousands of tickets to a concert, not all of them are sold out. In managing its pricing, the orchestra pays less attention to capacity and focuses instead on how quickly tickets are selling. The marketing and ticketing team makes its pricing decisions by seating section. Using reports like the one reflected in Chart No. 6, the team can see how fast a section is filling up. The cooler colors (black, purple, blue) show seats that were sold anywhere from five months to a year in advance. These are most likely sold to subscibers or single ticket buyers who bought early. The warmer colors show tickets bought within three months (green) all the way to the week of the concert (red). 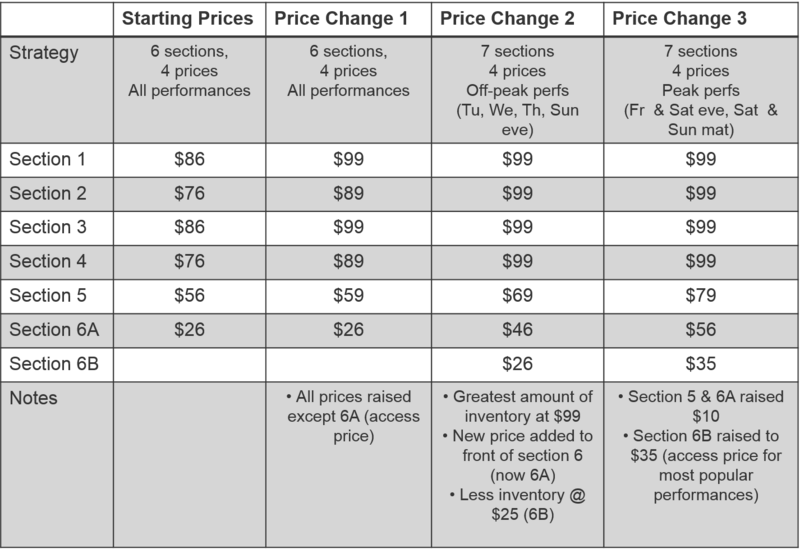 The sections that sell fastest (the black to dark green) are the prime candidates for price raises. The slower selling sections will most likely be discounted. 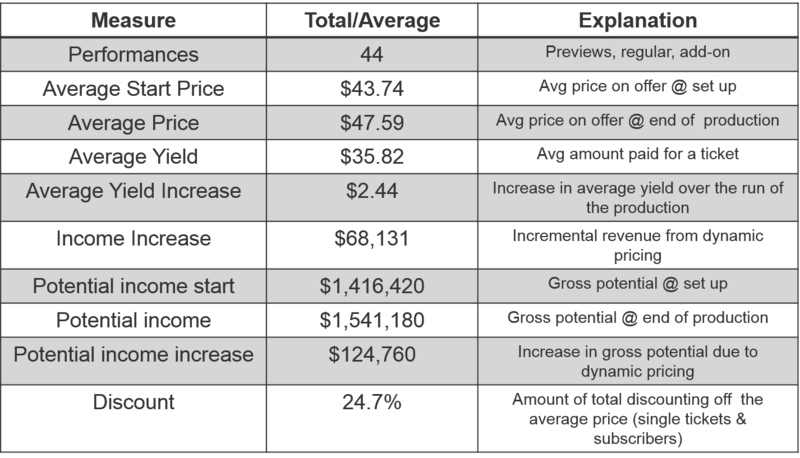 Using this approach for the 2013–14 season, the Cincinnati Symphony raised prices on over 15,000 tickets, discounted prices on slightly less than 2,000 tickets, and generated over $230,000 in incremental revenue on single tickets. Lessons learned from CSO’s success: Recognizing when and where to raise prices and using discounts judiciously can help to increase revenue in a challenging venue. Two seasons ago a popular musical played at the Arsht Center in Miami. The ticketing services team knew sales would be strong and used data to monitor the show closely from the initial on sale date. Their decision-making process is illustrated in Chart 7. End result: record breaking sales and over $150,000 in additional revenue. Lessons learned from Arsht’s Center’s success: First, make changes in stages; second, introduce dynamic pricing in conjunction with inventory management; third, differentiate strategy between peak and off-peak performances. Recognize that patrons are making decisions based on their personal price/value equations. Use a variety of data to support the changes and evaluate the impact of those changes. Keeping in mind the range and relationship of prices, and what value message is being delivered to the ticket buyer. Steven Roth is president of The Pricing Institute, a consultancy and software provider. Pricing Institute partners have helped hundreds of entertainment organizations worldwide develop pricing strategies that maximize income and increase attendance. 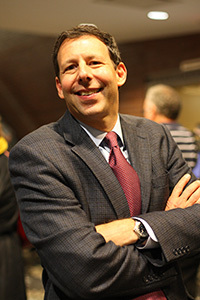 Steven is a frequent speaker at conferences and universities; he is chairman of the board of ArtsBoston, a 175-member audience development organization.